buckle There is 1 product. 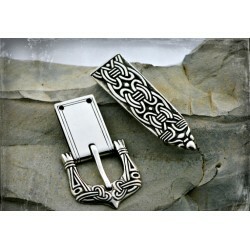 Replica of Viking belt fittings : sterling silver buckle and strap end with beautiful and elaborate decoration in Borre style. Both based on finds from Birka, Sweden, Viking period. All elements in this set are solid pieces of sterling silver, these aren't thin plates, but a historical Viking adornment built to last.